It was a warm summer evening in 1982 when Patty Girouard’s then-husband brought home a couple bushels of ripe peaches, exclaiming what a “good deal” he got on them. “That’s great, honey,” she replied, discretely biting her tongue, having visions of how two people were going to use this enormous quantity of fruit within its short life span. And so it was peach cobbler, frozen peaches, peach melba, peaches and cereal, and peaches galore before she discovered what would be the stepping stone to a new business idea: peach conserves. Good question – and the answer came not so gradually. At the time, Patty was new to the sport of running and was discovering what wonderful, creative ideas would appear in her mind as she traversed the Vermont countryside, conquering one hill after another, leading her to believe anything was possible. Her business plan evolved on her runs and the next thing she knew, she was at the bank securing start-up capital for her new venture. That was almost 20 years ago. Over the years, the product line increased from 4 flavors to over 28 under the Vermont Harvest and Stowe Hollow Kitchens trademarks. In 2001, the company began a consolidation process to eliminate some flavors, change packaging, add new sizes and form an LLC. Pan Handler Products and Stowe Hollow Kitchens combined with Vermont Harvest to form Vermont Harvest Specialty Foods, LLC. The best selling conserve is Apple Rum Walnut, which tastes just like the insides of Mom’s homemade apple pie. It’s terrific with a piece of Vermont Cabot cheddar cheese on top, and great over ice cream, too! 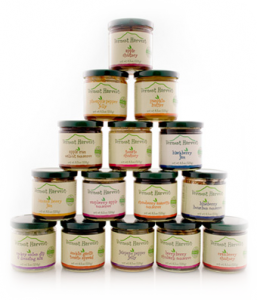 In 2007, Vermont Harvest Specialty Foods, LLC was taken over by Whip Burks, a graduate of the New England Culinary Institute (NECI). Whip grew up in Princeton, NJ, and has always been fascinated by cooking – which lead him to Vermont back in 1999. Whip attended NECI from 1999 to 2001 where he earned an Associates degree in culinary arts and a Bachelors degree in Food and Beverage Management. After several years in a restaurant setting and with Ben & Jerry’s Retail division, Whip was ready to take on his next endeavor. Whip formed Vermont Homemade Memories LLC and has since been on tear to take Vermont Harvest to the next level and start distribution to the rest of the country. In his first month of ownership he created a Pumpkin Butter that tastes like pumpkin pie in a jar (mixing it with cream cheese makes a mean pumpkin cheesecake!). After keeping a low profile for the first year, things began to really happen in 2008. Whip hired Marketing by Design from Beverly Massachusetts, and introduced a new fresh look to the label. New to the lineup in 2009 are Blackberry Jam and Raspberry Apple Conserve. With multiple products in the pipeline, but a very refined palate, Whip is determined to only release new offerings that mesh well with the products of the past. Vermont Harvest continues to use only the finest natural ingredients and buy local as much as possible. Local Vermont Cranberries have recently been added to recipes as they try to use more local ingredients when they come available. Please visit Vermont Harvest’s new website and help the recipe blog grow. If your recipe for a new dish is a hit, Vermont Harvest will give you credit and publish it in the new recipe pamphlet. Vermont Harvest products are available at select gift and specialty food stores in New England and through mail order. For more information call 1-800-338-5354.